I had hoped to update the blog by being able to work on my backlog of posts and half written reviews, but my time is not my own when I'm not in Taipei. So until I get the chance to carve out the time to do that, I will be posting a slice of the good stuff I have been eating the past month. Sort of a frou frou steakhouse in the back of the Hard Rock Hotel, SIMON served unusual and very tasty breads such as pretzel bread, zucchini bread and cinnamon muffin-like bread in their complimentary refillable bread basket. The mediterrean appetizer plate's portions were quite sparse for the price, though the flavors were good for the sponge-like mini-pita breads. I ordered the meatloaf, but should have stuck to the filet mignon- as the meatloaf was dense, bit too salty and not quite what I expected. It was like an overgrown cousin of a burger covered in sauce and cut in half. I suppose I expected a softer, melt-in-your mouth Japanese style meatloaf? I barely took three bites and didn't even care to finish the rest. But everyone else mostly cleaned their plates and the calamari appetizer and the sauteed mushroom sides were a hit- as well as the HUGE ball of cotton candy (otherwise on the menu for ($8) the waiter brought us free of charge. I liked the lunch buffet at Mandalay Bay- they offered a decent selection of fresh fruits as well as the standard rows and rows of heated foods. The cocktail shrimp were fresh and plentiful, and the lamb chops were actually tender and flavorful. They carved prime rib for you and had sections for meats, salads, Asian, Latin and seafood. It was the first time I had seen carnitas at a buffet, much less a Las Vegas buffet, but it was surprisingly good. I went back for seconds of the tender carnitas and Spanish rice while I didn't sample too much of the Asian food. The desserts were hidden away from the main part of the buffet, so you could have missed it if you didn't look for it. But with rows of mini lemon meringue tarts, tiramisu cakes and cheesecake, you should definitely save room. Intending to get a light dinner, we unknowingly walked into a set set-course menu at AUREOLE, which offered only set courses for their menus in their main dining room. Not until we read the fine print outside after the dinner did I realize we could have ordered ala carte upstairs (I think)... so we dove in and had a very elegant and fun dinner for a $$$ price. I had a scallop trio appetizer, wild salmon main course and warm chocolate cake dessert. With the scallop trio, I preferred the center grilled scallop over the variations of it being fried or in the rice paper, but the salmon was grilled just right. Though I thoroughly devoured my chocolate cake, I didn't care for the pistachio (?) ice cream on the side that just tasted like cream, as pretty as it was.. Instead, I would have liked to have some fruit flavored sorbet like my friend ordered, which came in a sampler tray almost like a pastel mini-rack of pool balls. We had fun guessing what each flavor was. DEE's had diner food at amazing prices- my breakfast all day French toast combo plate was under $6 with four huge slices of Texas French Toast and three huge hockey puck sausages and an over easy egg. Maybe it was late, maybe I was hungry, maybe I had been eating fake American breakfasts in Taiwan for too long - but it was the best breakfast I have had in a very long time. Something about chicken enchiladas just gets to me... I love it when they are soaked in the red sauce and baked til the cheese is melted and gooey on top.. the bite of the corn tortilla and the shredded chicken is heaven. Plus you have to have carnitas taco with guacamole as well. It's cheap, it's fast and it's easy- sure it's mall food- but for NT$150, you can get a pretty good bim bim bap. Plus the rice gets all crispy on the bottom and you can either stir it up yourself or eat it all separately like I do. The sides are pretty tantalizing too- with a range of kimchees, potato salad, vegetables and tempura, you can get a choice of 3 for NT$80. There are two Korean places in the basement food court at 101, so be sure you try out the one that looks like this. It's the one near Watsons. They also have hot pot selections you can eat at their bar-like seating. Sometimes during weekends and rush hour, it's hard to get a seat with their affordable prices. You get complimentary side dishes too when you get the hot pot selection. The other Korean shop has good sides, such as curried potato and cold jap chae, but the bim bim bap here is better. The second time around, everything was delicious. I suppose you have to stick to what your friends and the waiters recommend when you are visiting a favorite restaurant of someone you know. The last time I came to Mr. Paco's, I was a bit underwhelmed. The food had been hyped up to me and it didn't live up to the hype. But this time- it did. The salmon salad had a tangy dressing- and though I am not a big fan of smoked salmon, there was enough fresh romaine and tomato to go around. The baked eggplant mozzarella appetizer should be eaten as soon as its served. With a bit of pesto dressing the cheese, it was like the mushy hot little sister to a tomato mozzarella caprese, in a good way. The hawaiian pizza plus mushrooms was loaded with cheese and toppings that didn't overwhelm the thin crust. The tomato sauce had a lot of flavor and everything about the pizza worked- it's probably one of the better pizzas I've had in Taipei and definitely great portion for the price. Recommended by the waiter, the lemon chicken spaghetti was unusually refreshing and light yet fulfilling at the same time for a cream sauced pasta. I was a little doubtful when he recommended it, expecting the lemon to be too strong, but instead it was a perfect match. The cream clung to the spaghetti like a creamy coat and I wanted to mop up the rest of the sauce with the chicken and shiitake mushroom slices. The spaghetti was al dente and didn't last very long on the plate. We showed up again a little early to an empty restaurant with our choice of seating to choose from- this time for lunch- but it quickly got crowded as lunch hour approached. I have to note also that the service is especially kid friendly and nice, without being overbearing or fake. With all the food, we didn't have room for dessert, but next time, I'm saving room for the strawberry crepes that I spotted at the counter! Mr. Paco might sound like a dive that serves Mexican food, but actually it's a quaint comfortable restaurant that serves Italian fare such as pizza, risotto, pasta, salads and desserts. My friend works near here and raved about it to me more than once. After a long day, we thought we'd have an early dinner around 5:30pm or so. The space was really cute and bisto-ish, with burnt orange walls and candles on each table that would be great for a romantic date or a lively dinner out with friends and family. It was unusually quiet because we were there off-peak- she said it's sometimes hard to get a table during their rush hours. She told me that she usually ordered pizza and pasta, and was happy to try some new things that looked appealing to me from the menu which was in English and Chinese. The menu had a pretty wide selection of antipasta, salads, pastas, pizzas, and main dishes like risottos, paella and kebabs. We chose to split a chicken asparagus mushroom salad, steamed mussels with white wine and sundried tomato and prosciutto risotto. 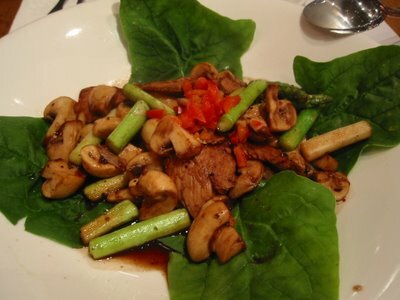 To my surprise, the salad we ordered wasn't really a salad- more like a stir-fry with four leaves of lettuce, and nothing in the menu listed it as a hot salad. The flavor was not bad- with a bit tart with balsamic vinegar flavor which was soaked up by the chicken and mushroom, but not the asapargus. It was also very peppery and a bit watery. chicken, asparagus and mushroom salad? 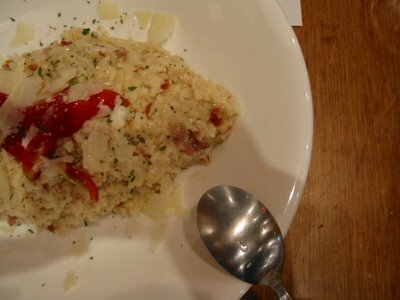 But the risotto hit the spot. It was creamy, hot and flavorful. Although I have to note, there was no cheese- only a few of their risottos have cheese. Perhaps it was my own fault for try to explore the items off the beaten path of popularity for this restaurant- or maybe my tastebuds were different from my Taiwanese friend. I will go back and try the pastas and pizzas someday, but I suppose at any restaurant you are going to strongly recommend to a friend- you want anything off the menu you order to amaze your tastebuds- so you won't know if you always stick to your favorites. But with a menu this large, maybe there will be a few misses before we hit the jackpot. kid friendly? : high chairs available, though no room to put them in some booths. a lot of things on the table including hot pot so not for antsy kids who can't keep their fingers off the table. Sorry for the lack of posts. I wanted to try and put up posts more often in 2007, but traveling back to LA, jetlag, getting sick and work has put a dent in those new year's resolutions! Plus I don't have all the business cards/addresses translated - but I know you just want to see pictures! So I will do my best to catch up on my backlog of half-written posts and update with the other information later. The winter weather is the perfect excuse to go out and eat hotpot, not that you really need an excuse to eat hotpot. Maybe known to some as "shabu shabu," if it's not all-you-can-eat buffet style, then you basically order your options from the menu, and cook it yourself in a pot of hot boiling water (or broth) on the table. The options can range from spicy hot "ma-la" hot pot to a place like this- with over a hundred of types of mushrooms! We had mixed up our reservations for a busy Saturday night (the restaurants named "Orange" (the fruit) is not the same as "Orange" (the color)- a subtle but distinct difference in Chinese- left us without reservations at the trendy Orange hotpot restaurant) so we ended up finding space at the Mushroom hotpot place. They start you off with a pot of broth with some herbs and then bring over a tray full of various vegetables and more mushrooms than you could imagined existed. There are fat, skinny, long, short, spidery, stubby, crunchy, chewy- all sorts of mushrooms that go into the mushroom broth. The different set menus offer different choices. I love mushrooms, so it was very exciting for me. The servers put all the mushrooms and vegetables in for you and then set the timer, which will let you know when the hotpot goodness is ready to eat. They also gave us mini dishes of dried mushroom and mushroom floss, both which were really addictive.The floss was chewy and salty and the dried mushroom had a good crunch with an intense flavor. Both of these are also available for sale to take home. I ended up buying both and eating the dried mushroom as a snack- perfect for when I wanted something to munch on, while being relatively healthy! 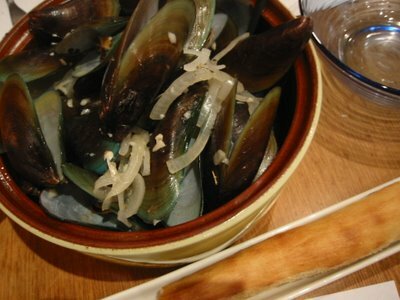 In the meanwhile, we chowed down on our abalone mushroom, which was a giant long (and yes, very phallic looking) mushroom that did have a meaty texture like abalone. It was like a duo, as they seed the same mushroom boiled and chopped, served on ice. They paired with soysauce and wasabi to dip in, so I guess it was like mushroom sashimi. Our set menu included these two appetizers, while our friends set menu included mini mantoh or steamed buns with a sweet condensed milk dipping sauce. They came in assorted flavors and were soft and warm. I wasn't really used to the condensed milk eaten with mantoh- it belongs on shaved ice! While the mushroom hotpot is perfect for vegetarians, they also do serve meat, so we had some sliced pork for our hotpot! They came in perfect frozen curls, like the kind you see at Mongolian bbq places that don't want you to pile a lot of meat into your bowl before it's stirfried. They also had a little pot of meat mixture that we could scoop up into little balls and drop into the soup. This was one of their signature dishes- they were like chewy meatballs with the starchy fishcake texture. We also had dumplings, but they were not as tasty as all the other dishes. At the end of your meal, you have a perfect broth to sip from to keep you warm to go back out into the cold winter air and all the mushrooms don't get mushy, but just get more flavorful. If you don't finish, you can even take it home- they will give you a sturdy plastic bag to put it in. 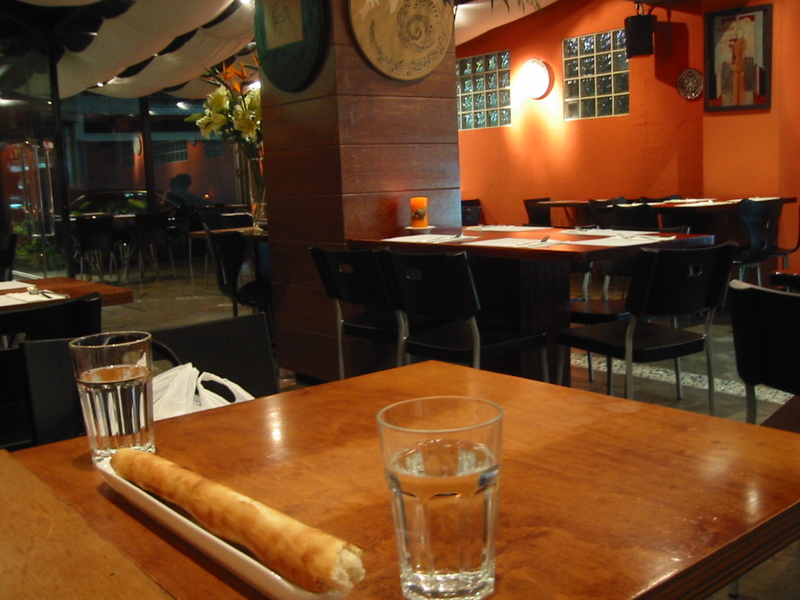 The restaurant is very clean with separated areas for seating. It's perfect for families or friends- it's not as trendy with dark decor/lighting as Orange or even Buffalo Yakiniku, but it's good. Their menu is only in Chinese, so you might have to go with the pictures or bring someone who speaks Chinese to help order. You're going to get mushrooms, any way you order! They do talk a bit about the mushrooms and their benefits which I missed out on. If you have room, they serve a little panna cotta with some strawberry sauce on top for dessert. It's not the best panna cotta I've had, but at least it wasn't mushroom flavored! This mushroom hot pot restaurant is actually a part of a chain, so there are quite a few locations around Taiwan. It's been very cold in LA, so I imagine it's been cold in Taipei still- the hearty hot broth and mushrooms will definitely help. Starbucks Coffee is strangely addictive- I prefer to get a vanilla latte (although I do like Coffee Bean's vanilla ice blendeds better, but there isn't one in Taipei) although there was one a few years ago and it mysteriously vanished. Their bagels, cookies, cakes, sandwiches, salads are also a quick snack fix while you grab your overpriced but usually consistent coffee anywhere around the world. I'm definitely guilty of purchasing something to eat at the airport, convention, hospital, or on the run... in this case, we had an impromptu afternoon tea of sorts on the way to the new Taipei Apple reseller store that just opened. The ham and cheese sandwich was actually pretty tasty- it definitely benefited from being heated up and the bread was all warm with the melted cheese. The cheesecake looked good, but unfortunately tasted awful. It was dry, bland and the crackly creme brulee-looking top was just a facade. It made me sorely miss the decadent creme brulee cheesecake at Literati in Los Angeles which has melt in your mouth creaminess and real vanilla specks and flavor. In Taiwan, one of the best NY style cheesecake I've had so far was at NY Bagel, which has Junior's cheesecake flown in from NY, or Macaroni Grill. A more local style, but still delicious, are the cheesecake cups they have at Milkhouse or the cheesecake at the bakery at JASONs Supermarket at 101. The vanilla latte was good for a rainy afternoon, and apparently when we were there, with the purchase of the sandwich they upgrade your drink a size up for free as an "afternoon tea" special, or "afternoon latte" i should say. I also spotted someone with a pasta... Most of the Starbucks have cozy tables and sofas to encourage some lounging and makes a great space for afternoon tea. Not this time, but once I had the pre-made chinese chicken salad in a box. The dry chicken and odd tasting dressing ruined the salad and made it so terrible I threw it away after one bite. But anyways- check out the new Apple store if you get a chance. It's not technically an "Apple Store," but it's the closest thing for now as an official Apple reseller with all the tech goods and accessories in the pristine white space. There's no genius bar, but the associates are quite friendly and helpful. There's even a coffee shop upstairs if you are going to wander over with your laptop. I didn't get to try it, but that's for another day. If you're not an Apple person, the whole street is filled with shops selling computers and accessories, like cables, printers, cds/dvds and even cameras at prices better than mall stores like fnac. It's pretty amazing that there are so many Starbucks around the world, even in Taipei there's practically one on every block. The funny thing is that many of the local companies knowingly capitalize on their branding, mimicking the round logo, bold sans serif lettering, and even the Starbucks shade of green. Maybe it's just a coincidence? A friend of mine recently had to choose from three different coffee shops at 101- Barista Coffee , some french sounding coffee place and IS Coffee- he said he was comforted by the round green logo of IS Coffee and bought his coffee there. Another amazing thing is that Starbucks plans on doubling their stores here in the next five years to 350 stores. Hopefully, they will keep working on their cheesecake! happy new year from taipei! HAPPY NEW YEAR! Can you believe it's 2007 already??!!! Had a nice dinner at the Ambassador Hotel and then some late night snacks at a company party. and shabu shabu broth and vegetables.. I was an invited guest, so I don't know how much the dinner was, but everything tasted delicious and the service was great. So I would recommend Szechuan Court also since this hotel has been around for a very long time- probably one of the first international hotels in Taipei. I must be getting old... it's not even 2AM and I'm probably going to turn in for the night. I'm just glad I'm not stuck in the traffic.. it was madness after midnight.